Dalbeattie-based care at home provider Stewartry Care became an employee-owned company in 2004. It has more than 100 staff providing care at home services across Dumfries & Galloway. In the first year of employee ownership its turnover increased by 16% and profitability by 39%. Since then the company has continued to flourish, with new services including a Foot Care and a Responder Service supporting over 400 individuals. 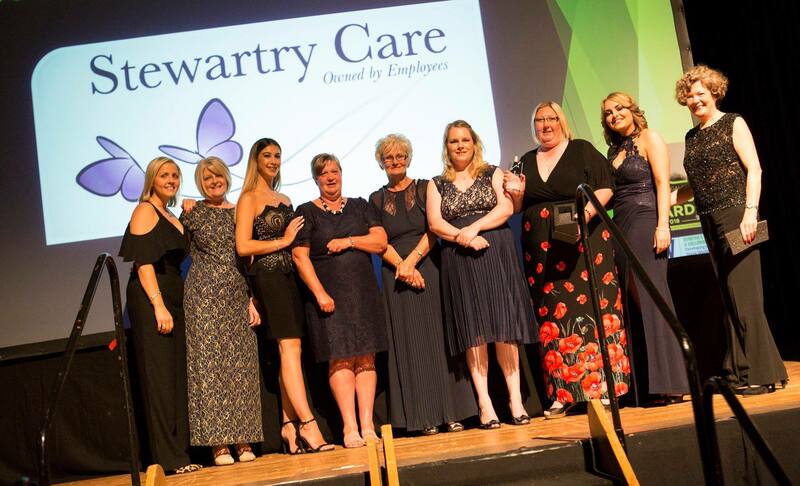 We caught up with Stewartry Care manager Debbie Cochrane to find out more about the company and its recent successes. “We believe that employee ownership is good for everyone involved in the company. Our employees are happy at work which is demonstrated by our staff recruitment and retention records. The staff benefit from being able to influence the direction of the company, being informed on performance and having the opportunity to stand for election as a director or trustee of the company. Our clients also benefit from having a highly motivated team, knowing that their care team is empowered and the reassurance that the company will remain locally owned and run for the benefit of local people. The awards recognise the great work undertaken by organisations and staff who work in care at home and housing support services. The company has also just been awarded Outstanding Social Enterprise at the Dumfries & Galloway Business Awards. Debbie continued: “I’m incredibly proud to manage such an amazing team; these awards recognise all their hard work. This entry was posted in BLOG on June 25, 2018 by CDS Admin.